To apply to the North East Partnership SCITT applicants must use the UCAS ITT application system. Applications can be submitted from mid-October for a September entry the following academic year. As demand for places is very high interested applicants are advised to apply early. For the 2019/20 academic year applicants will be able to use the new DfE search tool ‘Find Postgraduate Teacher Training’ to search for courses prior to applying through UCAS Teacher Training. 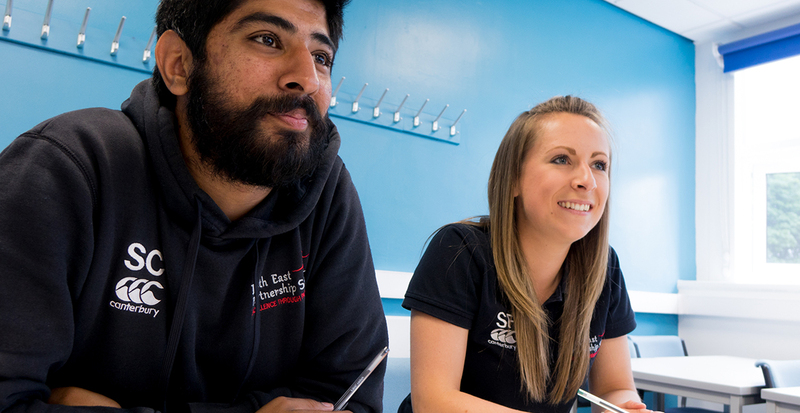 For the 2019/20 academic year we hope to recruit twenty eight secondary physical education SCITT trainees and twelve primary with a PE specialism School Direct trainees. The UCAS system will automatically forward applications to the programme team who will send an email acknowledging receipt. Shortlisted applicants will be invited to an interview day at one of the partnership schools; these days will consist of a group task, a literacy task, a teaching episode and a formal interview. The interview panel will comprise representatives from the partnership schools. You will be notified through UCAS of the outcome of your interview. We are looking for individuals who are well qualified with relevant and up-to-date experience and who have interests and talents that would enhance children’s learning experiences. You should be enthusiastic, hardworking, resilient, happy to ‘think outside the box’ and have well developed organisation and communication skills. You will need to be able to use your initiative, manage workload and work co-operatively and effectively with others. You must be passionate about a career in teaching and enjoy working with young people, building warm relationships that promote learning.